Small Steps? Or Giant Leap? I am always up for a new challenge and don’t often shy away because something might be “too hard” or “too much work.” In fact, those are my least favorite words to hear in a school. The idea of genrefying a library’s collection, whether it’s called “Dewey Light,” “ditching Dewey,” or “bookstore model,” is appealing because it empowers users to help themselves. When I walk into a bookstore, I can usually find the section I’m looking for without asking a salesperson for help. In my own high school library, I’d taken the smallest possible step by pulling out the graphic novels from 741.5 and shelving them in their own easy-access location. 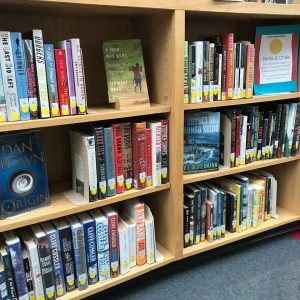 But whenever I read articles about how librarians go about actually changing their collections over to a new organization system, it sounded like a Herculean task, something that would take all summer and require touching every single book, recataloging, shifting shelves, re-labeling or stickering, and more. Could it be done in stages? Sometimes I need the right nudge, which is often the result of collaborative and collegial conversations, and/or when I put my students at the center of our library. This spring, I was invited to give booktalks to the 9th-grade English classes. The teacher, one of my favorite collaborators, asked that I go for breadth (talk about more books!) instead of depth. She wanted her students to be exposed to some different fiction genres, and together we brainstormed the best ones for this group: fantasy, science fiction, realistic fiction, historical fiction, and suspense/thriller. To save time and transitions (to give students more time to read! 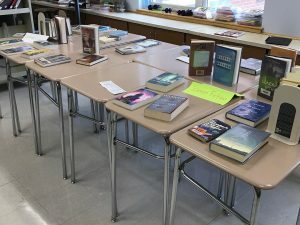 ), I would bring the library to the classroom by filling a cart of books organized by genre, along with my phone with the mobile app for checking books out. The teacher would take care of the room set-up, arranging the chairs in an audience format and ringing the outer edge of the classroom with the desks for my “displays.” I gave myself a new challenge: write Twitter-length booktalks! Could I entice readers to a new book with just 140-280 characters? 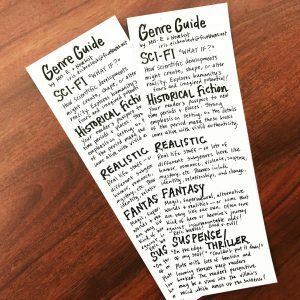 I printed off little slips of paper and stuck them in each book as a bookmark that I could read from. 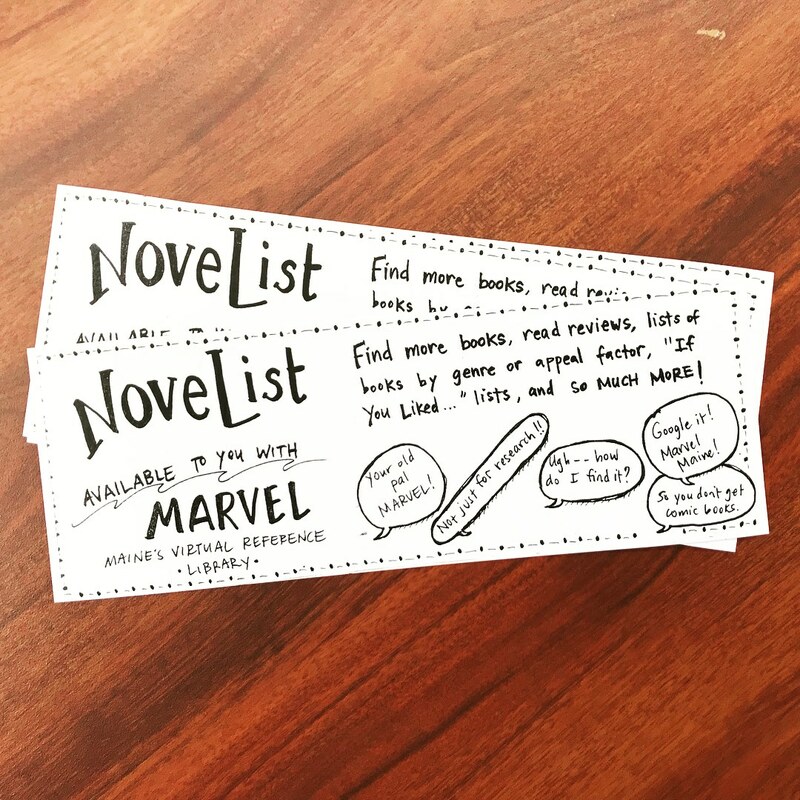 And because I love to give readers a present, I also created a bookmark to remind students of how to access NoveList through our state library database collection, with a brief description of each genre. After each class, I would trundle my cart back upstairs to restock it in the library, and the result was that I could see at a glance which genres were the most popular. Suspense/thriller was clearly the genre that these readers wanted, as I had to restock and resupply after every session! 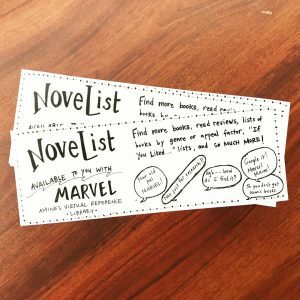 I even needed to write some new Twitter-length booktalks on the fly! Who are the most immediate beneficiaries of a genrefied collection? According to Gail Cornwall in a recent article for Mindshift, it’s those with developing literacy skills: “struggling readers, students not yet fluent in English, and those with learning disabilities.” Cornwall adds that these are the very readers who are less likely to use the card catalog, scan the inside cover, or preview a few pages. 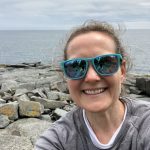 The idea of genrefication was buzzing in the back of my mind when I attended the Maine Association of School Libraries (MASL) Spring Symposium, and Cynthia Lutz, a district school librarian from RSU#19, gave a session about the process of genre-fying her elementary libraries. Now I couldn’t stop thinking about bringing this concept to my own library. The pieces were falling into place and I knew I wanted to start small, with the suspense/thriller genre. 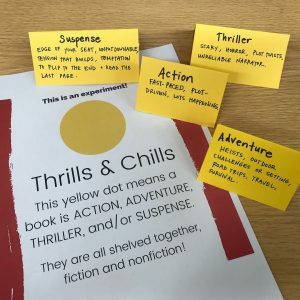 I read as much as I could about the steps in the process and came across a helpful blog post from Christy Minton, a school librarian from Massachusetts. 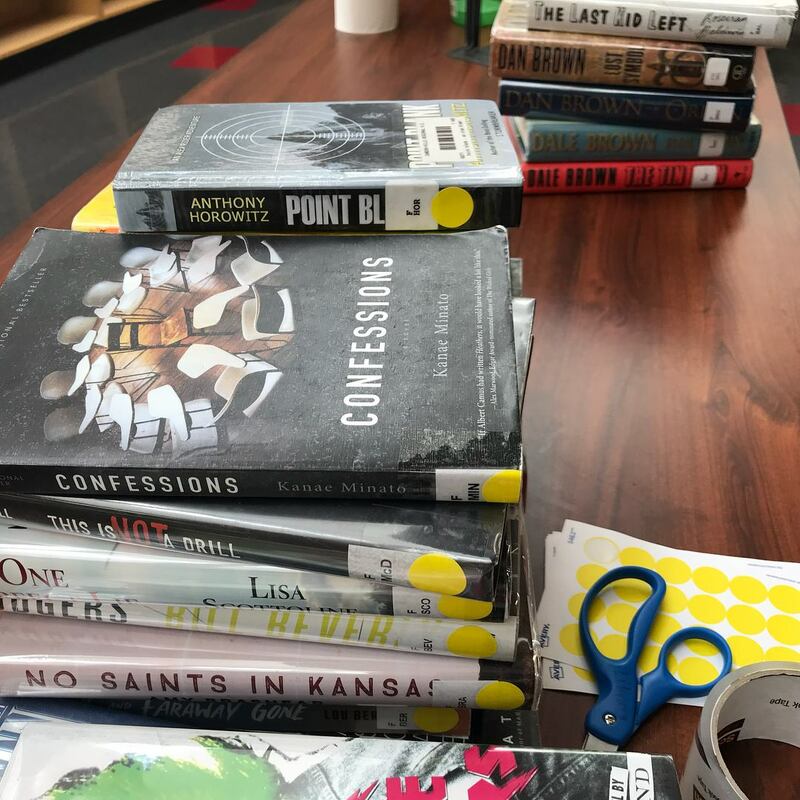 The project was such that I could pick away at it at slow moments during the school day: making some cataloging changes, then re-stickering each book with a yellow dot. 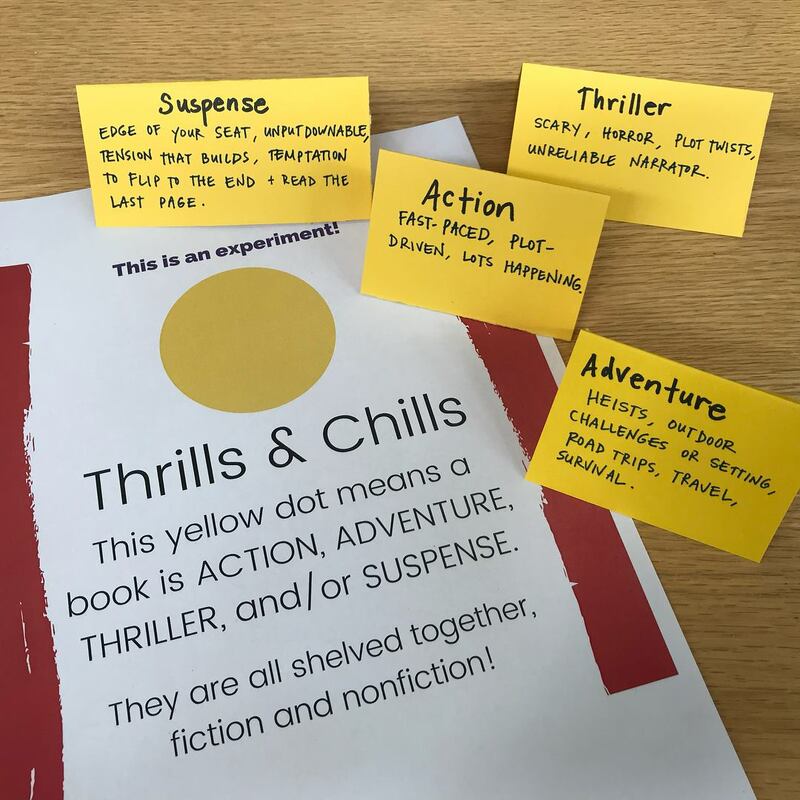 Soon the Thrills and Chills (Action, Adventure, Suspense, Thriller) section of our library was born, and was a first stop for many readers as they browsed for a book. I promoted the changes via our social media channels and with a prominent display in the library. Students love the independence of browsing in a smaller, more targeted genre, instead of the “black hole” of general fiction. 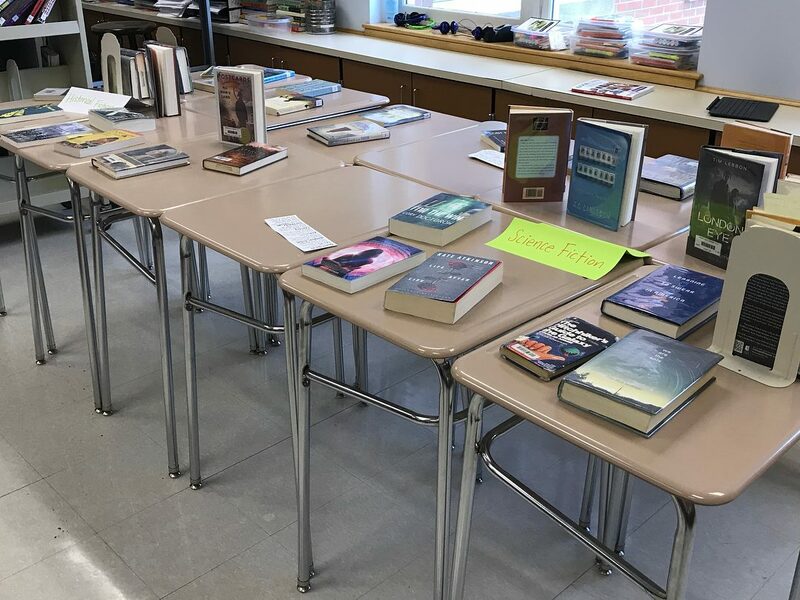 The Thrills and Chills section was so popular that I started pulling science fiction books as I inventoried the library at the end of the year; Sci Fi will be our next genre frontier! By pushing my own thinking and by imagining myself as an emerging reader, I was able to view the organization of the library collection as an issue of access. By re-imagining the library’s organization, I was removing barriers for readers. How do your students, teachers, and professional networks inspire you to take bold or innovative action in your library? Have you visited any libraries that have been genrefied? What other barriers to access can we remove for our readers?